TSA officials say 3,957 firearms were found in carry-on bags at U.S. airports in 2017. ORLANDO, Fla. - Orlando International Airport was once again named one of the worst offenders when it comes to travelers attempting to bring firearms on board their flights. 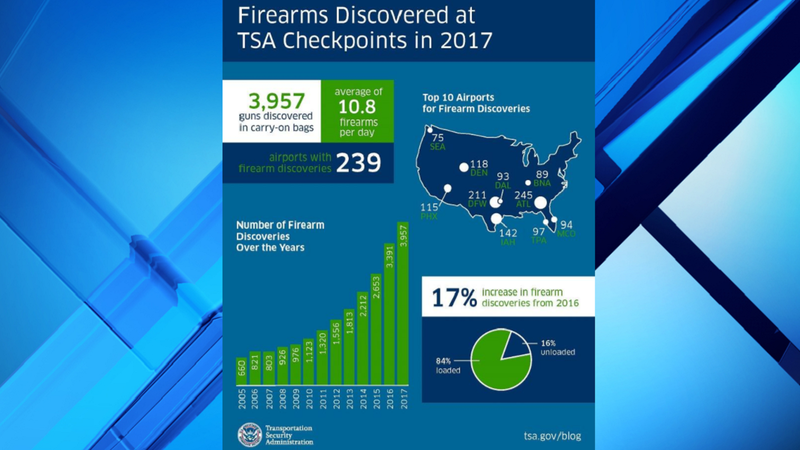 The Transportation Security Administration wrote in its annual Year in Review blog post that 94 guns -- 82 of which were loaded -- were confiscated from carry-on bags at checkpoints at OIA in 2017, putting it at No. 7 on the list of airports with the highest number of firearm discoveries. The number of guns is up from 2016 when OIA was No. 6 on the list with 86 firearm discoveries. The only other Florida airport on the 2017 list is Tampa International at No. 6 with 97 firearms, 90 of which were loaded, according to TSA. 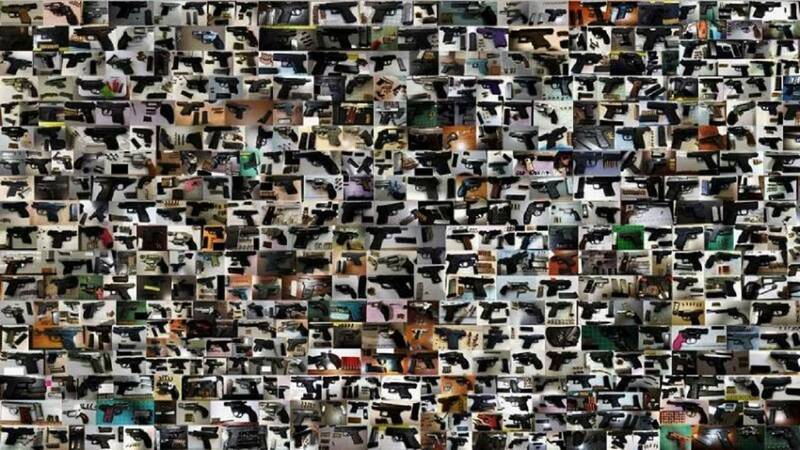 Overall, the number of firearms confiscated at airports nationwide went up 16.7 percent in 2017 for a total of 3,957 firearms compared with the 3,391 firearms found in 2016. That number averaged out to 10.8 firearms per day. Of the 2017 firearm discoveries, 3,324, or 84 percent, were loaded and 1,378, or 34.8 percent, had a round chambered. But firearms weren't the only hazardous items confiscated at airports across the country. TSA officials said the agency confiscates countless weapons each year, including inert explosive devices, gunpowder, inert hand grenades and other devices. 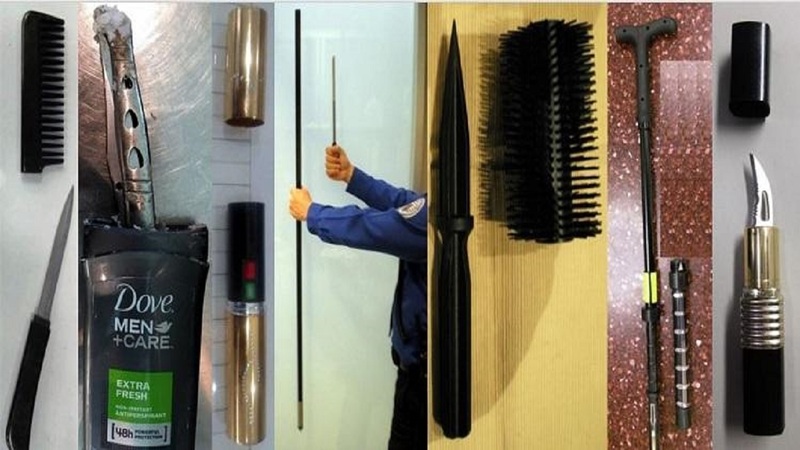 While in many instances travelers claim they simply forgot that they had the items in their possession, TSA officials said they found 198 items that were intentionally hidden or disguised in what is called "artful concealment." Those items, pictured above, range from a dagger hidden beneath the teeth of a comb, a knife inside a stick of deodorant and a stun gun hidden in a tube of lipstick. Many items such as firearms and pocket knives are permitted in checked bags, but other items such as gunpowder and firecrackers are never permitted on board a plane. TSA recommends double-checking luggage and any other personal items before leaving for the airport to be sure that there are no prohibited items inside. That way travelers can avoid civil penalties of up to $13,066, flight delays and other inconveniences. Guidelines for security screening procedures and how to pack certain items are available at TSA.gov. Anyone with any questions about whether specific items can or cannot be brought on board a plane can contact AskTSA on Twitter or Facebook for an answer.